During this 90 min workshop, learn the basics of Facial Gua Sha, skincare tips to Age Well, and dietary advice for glowing skin. This technique improves your skin's health, texture and overall condition, creates lift and glows your complexion. Participants receive a Jade Gua Sha tool, a Pearl Apothecary goji glow facial oil and a quick reference guide to take home! (Product value $35). Spaces are limited to 6 participants to ensure enough time for one-on-one instruction so reserve your spot today! During this 90 min workshop, learn the basics of Facial Gua Sha, skincare tips to Age Well, and dietary advice for glowing skin. This technique improves your skin's health, texture and overall condition, creates lift and glows your complexion. Participants receive a Jade Gua Sha tool, a Pearl Apothecary facial oil and a quick reference guide to take home! (Product value $35). Spaces are limited to 6 participants to ensure enough time for one-on-one instruction. Our initial visit includes a full intake, evaluation and diagnosis to find the root causes of your health condition. This visit includes an Acupuncture treatment and could include other modalities we think could help you such as cupping, gua sha, heat lamp, electric stim, topical herbals, or internal herbal recommendation. We will also formulate a treatment plan that we think will help you as quickly as possible. This could include acupuncture, diet and lifestyle recommendations. For patients who have been to our practice, follow up appointments can be scheduled online 24 hrs. from now. If you would like to be seen WITHIN 24 hours, call the office at 401-228-8160, and we will do our best to accommodate you! For those that are not nearby, meet Dr. Dilks on Skype where she will assess your condition and formulate a treatment plan for you. For new patients who are interested in exploring acupuncture and want to learn more about what we do at Emerging Energy. A holistic facial reflexology treatment that allows the practitioner to work on specific systems of the body using targeted zones or maps. Reflexology frees the energetic pathways and helps to bring back balance and strengthen the area in need. Your symptoms will determine what zone to work on and a customized map will be given to you which allows you to self care at home in just a few mins everyday. Great for an introduction to holistic skincare or as a quick refresher. Awaken and restore balance back to your skin with the use of organic and 100% natural products to address your skin's specific needs. A gentle enzyme mask is done with steam or hot compresses to help brighten and soften the skin. Carefully designed massage techniques are a main focus, to aid in toning, lifting and deep relaxation. *Extractions are included at practitioners discretion or if requested. A holistic facial reflexology treatment using targeted zones or maps. Reflexology frees the energetic pathways and helps to bring back balance and strengthen the areas of the body in need. Your symptoms will determine what zone to work on and a customized map will be given to you which allows you to self care at home in just a few mins everyday. This treatment includes a 50 minute facial. Awaken and restore balance back to your skin with the use of organic and 100% natural products to address your skin's specific needs. A gentle enzyme mask is done with steam or hot compresses to help brighten and soften the skin. Carefully designed massage techniques are a main focus, to aid in toning, lifting and deep relaxation. *Extractions are included at practitioners discretion or if requested. 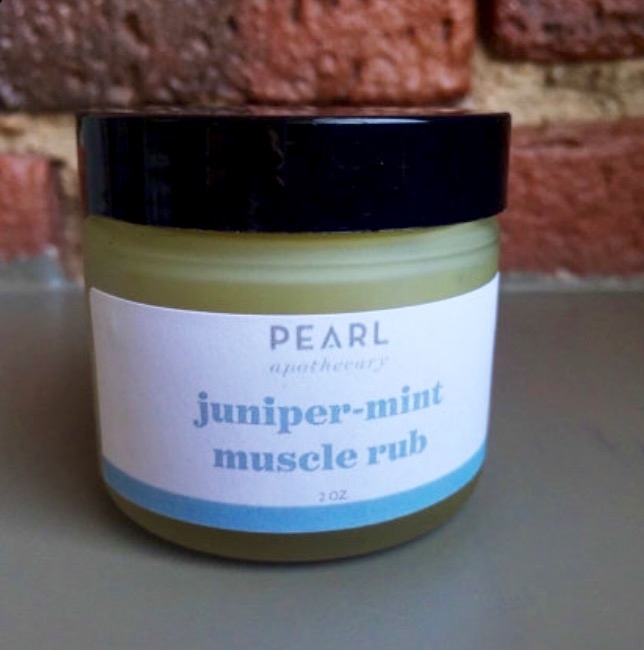 We make and use this fabulous pain relieving muscle rub in our clinic. Great for your home medicine cabinet or as a gift!